Murom, one of the most picturesque ancient towns in the Vladimir Region, is an attractive destination for tourists, eager to get familiar with Russia's ancient architecture and history. The territory of the Vladimir Region has one of the richest concentrations of historic sites in Russia, beginning with the city of Vladimir itself. Among the region’s most picturesque ancient towns is Murom, adorned with many churches and monasteries on the high left bank of the Oka River. Murom - named after a Finno-Ugric tribe, Muroma - has been overshadowed by other historic towns such as Suzdal, and by industrial behemoths such as Nizhny Novgorod (also on the Oka River). It has, however, earned an enduring place in the Russian imagination as the abode of two of Russia’s most beloved saints, prince Peter and his wife Fevronia; and as the land of the legendary Russian hero, or bogatyr, Ilya Muromets (Elijah of Murom). One of the oldest of Russian towns, Murom is mentioned in medieval chronicles under the year 862 as part of the domains of Riurik, the Viking who is considered the founder of the first Russian dynasty. Thereafter, Murom repeatedly appears among the towns granted to Riurik’s descendants. These early princes include the pious Gleb (ca. 987-1015), one of the many sons of Grand Prince Vladimir of Kiev, who formally converted the Eastern Slavs to Christianity in 988. According to medieval accounts Gleb’s zealous Christian faith alienated his pagan subjects, who rejected conversion and expelled him to a fortified residence on the outskirts Murom. After the death of Prince Vladimir in 1015, Gleb and his brother Boris were assassinated near Kiev in a fratricidal struggle for the throne. Refusing to engage in violence, Boris and Gleb were subsequently canonized by the Orthodox Church. Never a major power center, Murom was passed among various princes in complex divisions of authority over the vast territory of medieval Rus. By the end of the 11th century prince Yaroslav, son of Sviatoslav of Chernigov, finally subdued local resistance to Christianity. During the 13th century Murom was sacked by Tatar forces in 1239, 1281 and 1288. Feuding among local princes further weakened the town’s autonomy, and by the end of the 14th century it entered the domains of the rapidly expanding Moscow principality. With its advantageous location on the Oka River, Murom served as an important eastern outpost in the defense of Moscow against attacks from the Tatar state of Kazan. With the reign of Ivan the Terrible (1547-84), the town’s military importance dramatically increased in the early 1550s, when Ivan made preparations for the final attack on Kazan, in 1552. In the decade after the conquest of the Tatar capital, Ivan had four brick churches built in Murom as a votive offering. Only one of those churches still exists with basic elements of its original form: the compact Church of Saints Kosma and Demian overlooking the Oka River. Its most distinctive feature, a soaring brick “tent” tower resembling that of St. Basil’s in Moscow, collapsed in 1868. In 1901 the walls were covered with a low roof, which was surmounted in 2010 by a metal-sheathed conical roof, ornate in style but much lower than the original. Following the conquest of Kazan, Murom’s strategic role sharply diminished, and the town became a provincial backwater with regional commercial significance. Yet Murom remained a religious and pilgrimage center with a rich concentration of monastic institutions in the 17th and 18th centuries. After decades of neglect during the Soviet period, the monasteries and parish churches are being restored to impressive effect. The most ancient of Murom’s monasteries is dedicated to the Transfiguration of the Savior and is situated to the south of town on a steep bank overlooking the Oka River. Legend has it that the monastery occupies the site of Prince Gleb’s fortified refuge. The earliest written reference dates from 1096, but its oldest structure—the Church of the Transfiguration—was built in the 1550s and has been substantially reconstructed. The frescoes of the Transfiguration Church have been repainted, and the crypt contains a sarcophagus with relics of Ilya Muromets—who specialists believe was originally from a settlement near Kiev. Other churches, chapels and cloisters are spread around the spacious, park-like territory of the Transfiguration Monastery, which has become a major pilgrimage site. The center of Murom is graced with the ornate towers and churches of adjacent monastic institutions: the Monastery of the Annunciation and the Trinity Convent. The Annunciation Monastery was founded by Ivan the Terrible in 1553, but nothing has been preserved from that time. The monastery was destroyed in 1616 when Polish forces devastated Murom during the Time of Troubles. Its main Church of the Annunciation was lavishly rebuilt in the 1660s by the wealthy merchant Taras Borisov, known among the people as Bogdan Tsvetnoi (“the colorful”). In the 1640s the same merchant endowed the nearby Trinity Convent, whose ornate Church of the Holy Trinity is decorated with ceramic tiles. Its interior contains the relics of Saints Peter and Fevronia, canonized in 1547 and revered as exemplars of conjugal fidelity. Although their precise historical identity is subject to question, the 16th-century account of their life together is known by every student of medieval Russian literature. The north part of Murom is graced by the Convent of the Resurrection, whose 17th-century churches are now being restored. Like the Transfiguration Monastery at the other end of Murom, the Resurrection Convent has a sweeping high view of the Oka River. Similar to other provincial towns of the Russian heartland, Murom has its share of early 19th-century neoclassical mansions. Major fires destroyed the largely wooden urban environment in 1805, and the town was rebuilt to a neoclassical plan designed during the reign of Catherine the Great. Murom also has neighborhoods with wooden houses from the turn of the 20th-century, with their distinctive ornate window frames. By the turn of the 20th century Murom had become a railway center with significant textile factories. Industrial development continued in the 1930s, and during World War II Murom did its utmost in supplying the front lines. Parts of the town center were rebuilt in a Soviet decorative style, but the central district has preserved an attractive human scale. Murom has seen its share of economic difficulties over the past two decades, with its population declining to a current level of around 115,000. Nonetheless, the placid appearance of the town has shown considerable improvement recently, in no small measure due to the restoration efforts of the Orthodox Church. Murom also has an active local history museum, which has done its part to support architectural preservation. 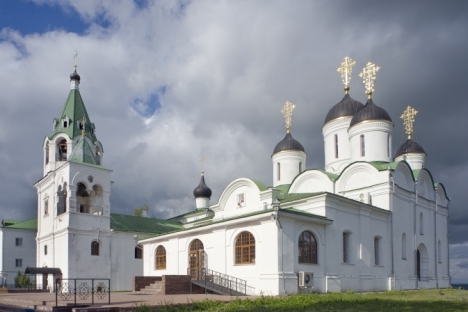 Readily accessible by train or car from Moscow, Murom is an excellent destination for those interested in Russia’s cultural and religious heritage.